Our second Monday morning and Jim and Pat got straight down to finishing the framing. 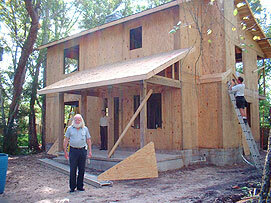 Here Pat is nailing down the 5/8 ply roof sheathing that Jim is ripping below. Note that, from this point on, we are less specific about work days as finishing out the framing has less of a daily flow. The porch roof done, Pat turns his hand to reinforcing the marriage of the first and second floors with external strapping across the floor truss interconnection. 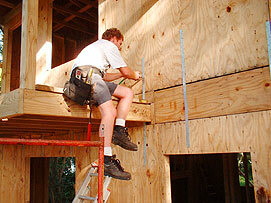 Here Pat is using a little hand-nailer to knock in almost 30 nails for each strap – a long process! Here’s a nice shot that shows the completed porch roof and Pat finishing off the mammoth job of strapping the outside of the house. Note the triangular peice of ply that is ready to be nailed up in the porch roof gable end. Up front is Harry – Barbie’s old friend – who visits the project every now and then to have his photo taken at this same spot. 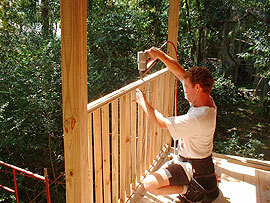 Time to build the railing around the balcony! We were looking forward to this job as we wanted to spend time on this wonderful feature that looks out on a nice pond. Here’s Pat carefully screwing accurately aligned balusters into a subrail. The balcony rail was finished in a morning – and beautifully done. Meanwhile, to prepare for fitting the windows, Jim is cutting 30lb roofing felt and nailing it into the rough window openings. 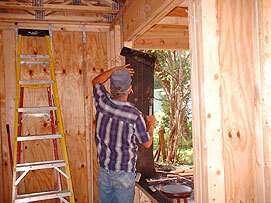 This ensures a watertight joint between the edges of the windows and the walls. 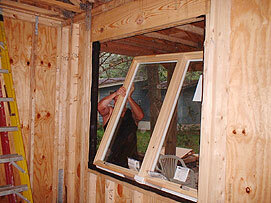 The windows have already been delivered and are racked vertically in the kitchen on 2x4s and carefully protected. Yay! We’re all set for the windows! 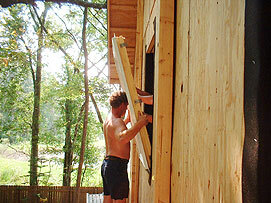 This photo shows Rick helping Jim set the window that looks out onto the front porch. All our windows are Andersen casement with impact glass. We decided to go with these because they are simpler to deal with than our only other option under stringent St. Johns County Florida coastal building codes – heavy shutters. Here’s Pat balancing an upstairs window for willing hands inside, while balancing himself on a platform across scaffolding. Note the little sprung metal clips screwed to the side of the window. These are essential to the impact resistance of the window unit by providing just enough “give” to make it flexible. While the framing crew were getting the windows together, the roofer – Andy Garbin – came to finish off …and he also brought the light green vinyl siding that will protect the walls of our home from the weather. 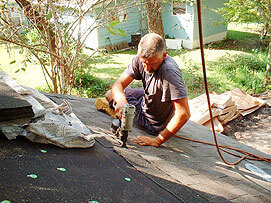 Here he is nailing the last few shingles to the front angle of the roof. This shot peeks out through the join between the balcony roof and the main roof. 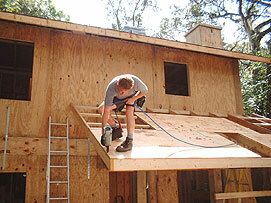 Wesley, Andy’s apprentice is finishing off the rear angle to the roof. 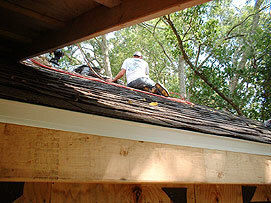 Note the white “drip edge” that joins the roof to the facia. Later, the facia will be wrapped with white aluminum to match. 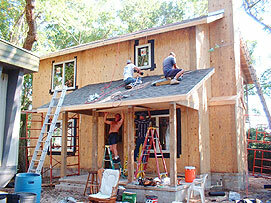 All these aspects of the framing process came to a head when Wesley and Andy were roofing the porch while Pat and Jim were cutting and installing T-111 siding boards as porch ceiling as the final structural aspect of the framing. Note the installed windows with roof felt around them and the edge of the mobile home at front. 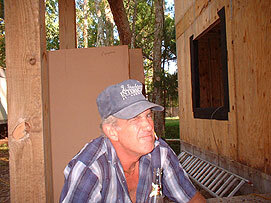 Delighted with the progress of his framing project, lead contractor Jim Stockton offers us his impression of Popeye. This is the nearest you get to an expression of exuberant joy from Jim on-camera.